On the heels of my Nature AI story comes my Amazing Stories AI story. and they were kind enough to create a cool illustration for it, too! (this is not an easy story to illustrate as you’ll find it when you read it!) I’m excited to be among the first authors to have original fiction appear in the resurrected Amazing Stories and happy to share this story with readers! Read “How Gaia and the Guardian Saved the World” here. It’s been a busy month. I traveled to Worldcon in Kansas City where I had a wonderful time, followed it up with a family vacation to Costa Rica where I also had a wonderful time, except I came back with a bad ear infection in both ears. (Bright side: the infection didn’t kick in while we were on vacation, only after.) I’ve been on two antibiotics and it’s finally clearing up enough to where I can write and work. Let me tell you, those things aren’t fun. Meantime, two of my brand-new stories have been published! “Dante’s Unfinished Business” was released on September 1 in Galaxy’s Edge magazine. It’s free to read for two months, and available via subscription/purchase thereafter. As I enjoy experimenting with all forms and styles of humor, it occurred to me that I’ve never written a pot humor story in the style of Cheech and Chong (well, sort of.) So I decided to try my hand at it, blatantly ignoring the fact that I’ve never actually smoked any pot. Making sure my references were authentic meant getting an entirely different set of beta readers in addition to the ones I normally use. But I’m told I mostly got the references right, so I hope you’ll enjoy the tale. I also wrote it after binge-watching two seasons of Rick and Morty and I think a lot of the humor in the story was also influenced by that. Plotwise, it’s a loose retelling of Dante’s Inferno, except Dante is a 21st century pothead and instead of Virgil he is shown around hell by the ghost of Bob Marley. The second story was just published online today, and will be in this week’s issue of the journal of Nature. “A Perfect Medium for Unrequited Love” is about artificial intelligence, love, and embedding communications “in the most interesting of media.” I wrote a more detailed “the making of” for the Nature Futures blog and you can read it here. I enjoy writing about artificial intelligence. 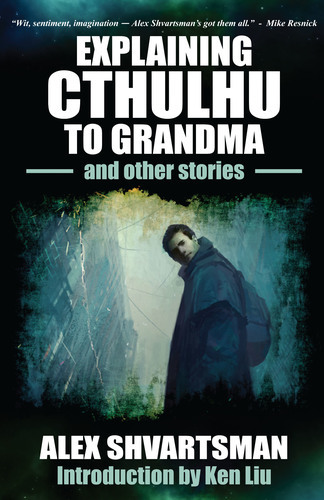 Another story that explores its themes is forthcoming from Amazing Stories in the coming months or weeks.